If you're a frequent patron of your local cinemas, you've likely heard of MoviePass, the service that gives you a movie theater ticket a day (with restrictions, of course) for a monthly cost. If you haven't heard of the service before or aren't generally interested in enduring the inconveniences involved with going to a theater, maybe this will pique your interest: MoviePass has just announced a new annual plan that works out to a slight savings of $0.34 a month. MoviePass is disingenuously claiming this new plan works out to $7.95 per month, but the $19.95 processing fee pushes it up to $9.61 a month. In fact, the only real benefit to this new annual subscription is a year of free access to the movie streaming service Fandor. MoviePass seems to be trying to push the $7.95 monthly narrative hard, probably in an effort to make it appear to match the Costco deal late last year, which offered a year of MoviePass and Fandor for $89.99 (actually $7.50 per month, and actually a deal). MoviePass is calling this new not-deal a limited-time offer for the US. If you sign up for a new MoviePass subscription, you'll be billed $115.35 ($7.95 per month plus a $19.95 processing fee, or $9.61 total per month) up front to cover the year. Fandor, the service that streams "handpicked" films and usually goes for $10 per month or $90 for a year, is also included, and that's really the only reason anyone should be jumping into this new annual plan. MoviePass—excluding the dishonesty behind the pricing in this annual plan—is a decent deal. However, there are limitations and drawbacks. For one, the service is limited to 2D movies and is available only at participating theaters. Chances are most of the theaters around you play ball with MoviePass, but check MoviePass' website to make sure your favorite theater is a participant. It's also worth noting that MoviePass recently pulled out of some popular AMC theaters due to some contention with the chain. As someone who jumped on the Costco deal in December, I can tell you that it's a bit annoying that you have to be within 100 yards of a theater in order to buy a ticket via MoviePass using its painfully mediocre app (below). But I'm willing to deal with that because of the value, and it seems like a lot of people would agree — more than 2 million, in fact, a subscriber milestone MoviePass surpassed this week. Our math was a bit faulty, and we thought this was a better deal than it was. It's still worth it if you're a subscriber to both MoviePass and Fandor, but for the rest of us, this new annual offer isn't the best. The article has been updated to reflect that. NEW YORK--(BUSINESS WIRE)--MoviePass™, the nation's premier movie-theater subscription service and a majority-owned subsidiary of Helios and Matheson Analytics Inc. (NASDAQ: HMNY) (“HMNY”), and Fandor®, the streaming service with the largest collection of independent films, documentaries, international features and shorts, are introducing a new annual subscription plan. This new MoviePass subscription plan will allow movie-goers to visit the theater every day for a year, and have access to the full Fandor content library for a year, for just under $116. 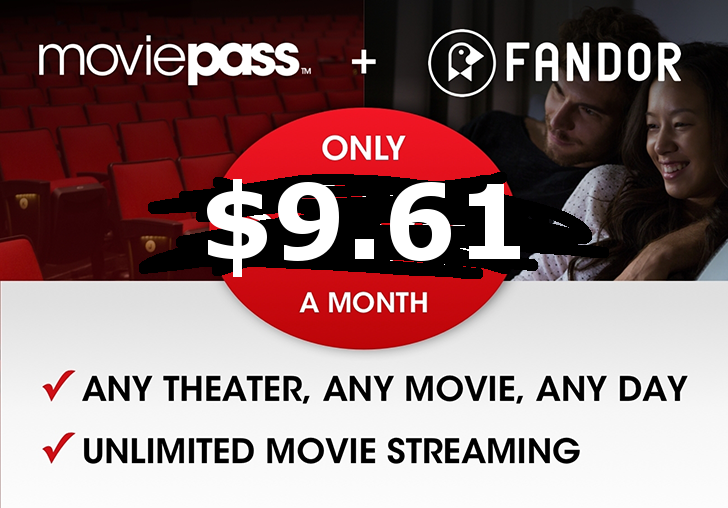 This new annual offer lowers the MoviePass monthly price from $9.95 to $7.95 and is coupled with an annual Fandor subscription. This combined offer is back after testing a limited time run in November 2017; it is now being reintroduced as a limited time offer nationwide. "Fandor is excited to be part of the disruptive wave redefining how audiences consume entertainment, making a broad range of movies available to our movie-loving subscribers," said Larry Aidem, President and CEO of Fandor. "We look forward to continued collaborations with MoviePass in the coming year." MoviePass presently drives more than 5% of the total nationwide box office and continues to grow contribution as new subscribers join. Subscribers who sign up for this new offer will be billed $115.35 ($7.95 a month + $19.95 processing fee), and will receive one full year of MoviePass and one full year of unlimited streaming from Fandor.